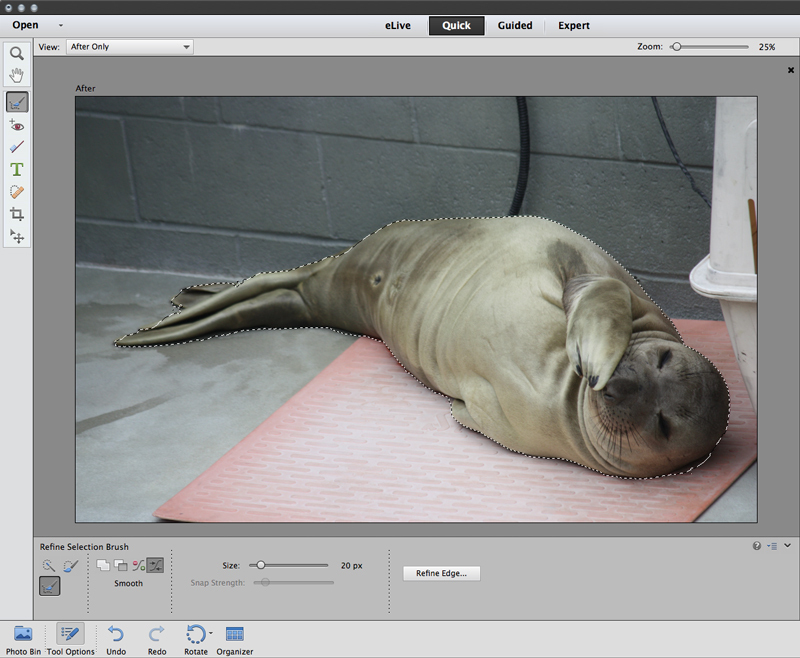 Every year — like clockwork — Adobe delivers updates to its consumer photo and video apps, Photoshop Elements and Premiere Elements, and that time has arrived. While the new Elements version 13 seems modest at first glance, a deeper dive into the apps signals a more significant upgrade than first appears. Among the new features common to both apps are support for High DPI on Windows and Retina Displays on Macs and new 64-bit support for Premiere Elements and the Elements Organizer on additional Windows systems. A major interface addition is the eLive tab (Elements Live), available from within both apps, which connects users to a portal containing a large collection of Adobe’s online tutorials and instructional materials as well as news, software updates and other regularly updated content for photographers and videographers. 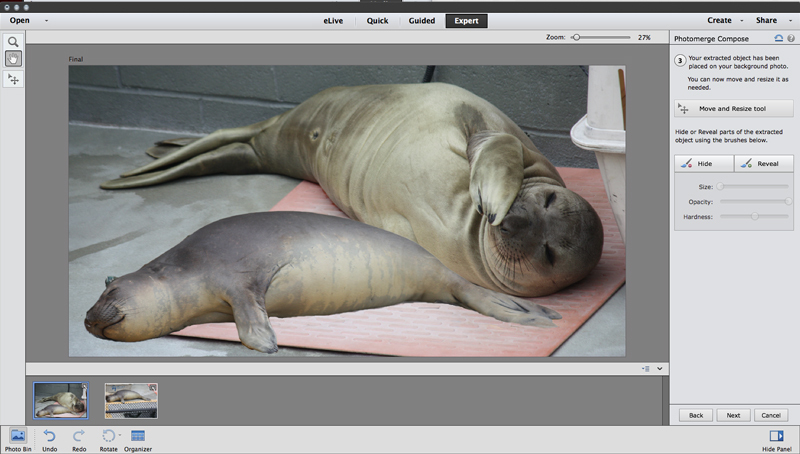 You might think these companion seals were relaxing together, but in fact the smaller one was placed into the scene via the new Photomerge Compose feature. Both Photoshop Elements 13 and Premiere Elements 13 venture into new territory, featuring updated techniques that, with the help of Elements’ signature guides, would otherwise require skill to accomplish. For the amateur enthusiast photographer set, some of Photoshop Elements’ new features require a steady hand. 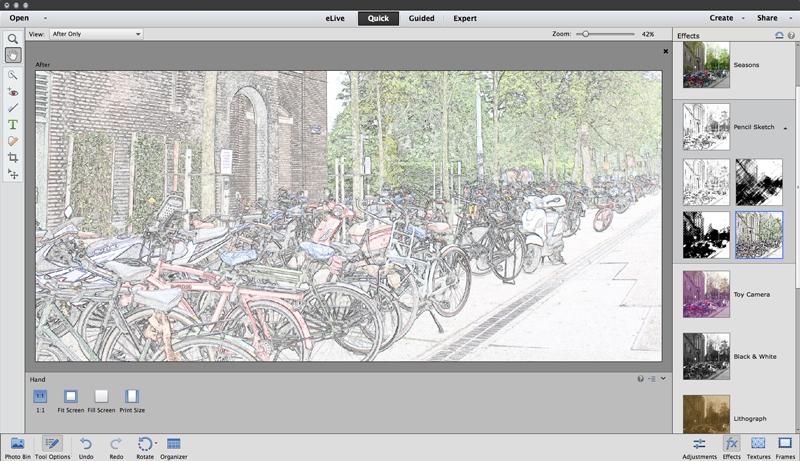 Photomerge Compose and the new Refine Selection brush work together for advanced compositing operations. With Photomerge, you use the Organizer to pick up elements from one photo and drop them into another, while the app automatically handles the lighting and blending to create a realistic-looking scene. You will need to be handy with the selection tools though, especially to take advantage of the new Refine Selection brush, which I found took a bit of getting used to. Compositing is more sophisticated now than ever with Photomerge Compose and the Refine Selection brush. Another new feature — custom tailored to Facebook — offers a different way to mix profile and cover photos together for an unusual artistic look. However, this feature only works if your cover photo suits this particular composition. It’s a cute idea, but it begs for more flexibility. 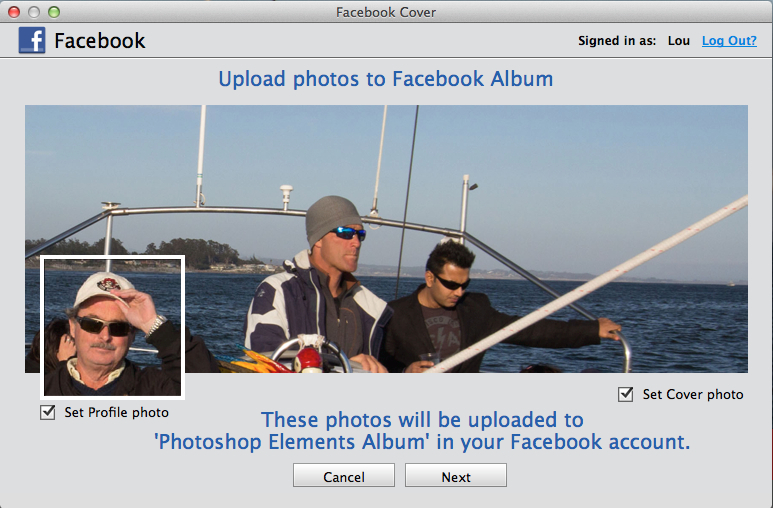 Combined Facebook profile image and cover photo is clever but limited. For example, there’s only two variations on the profile photo theme right now and neither one appealed to me. Plus, implementing it isn’t exactly a snap. After upload, you need to go to your Facebook page and finalize the new images because Facebook does not offer APIs to handle this automatically. 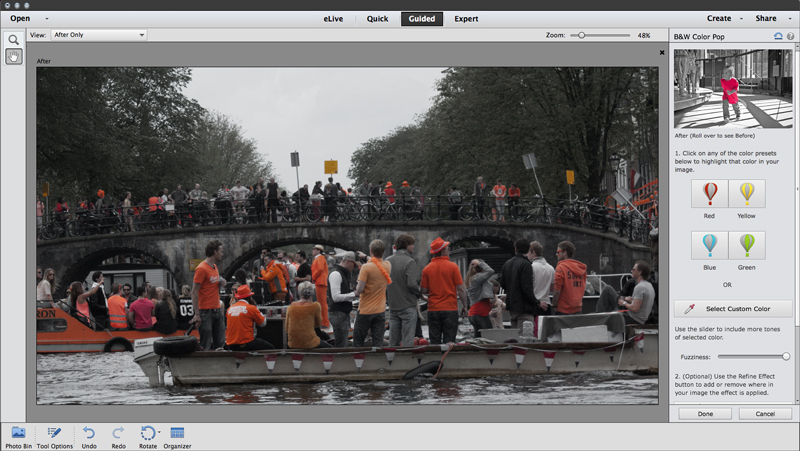 Thus, Adobe uploads properly sized photos, but then gives you a built-in video tutorial on how to finalize the process. This is the second variation on the Facebook profile photo, using multiple snaps. Whereas some might consider color splash effects a tad cheesy, I’m actually pleased with Adobe’s implementation of a similar concept. 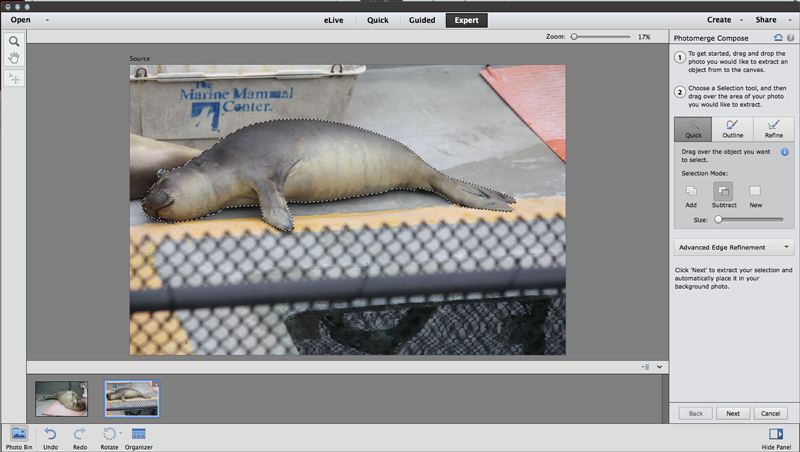 Instead of choosing one or two items to color in a bed of monochrome, Photoshop Elements’ B&W Color Pop feature lets you pick from four default colors or choose your own. You can also decide how much latitude the color will have within the image without having to brush in the color at every instance. B&W Color Pop gives a nice, balanced and unified look to a picture. Orange is for King’s Day in Amsterdam and B&W Color Pop calls it out easily. 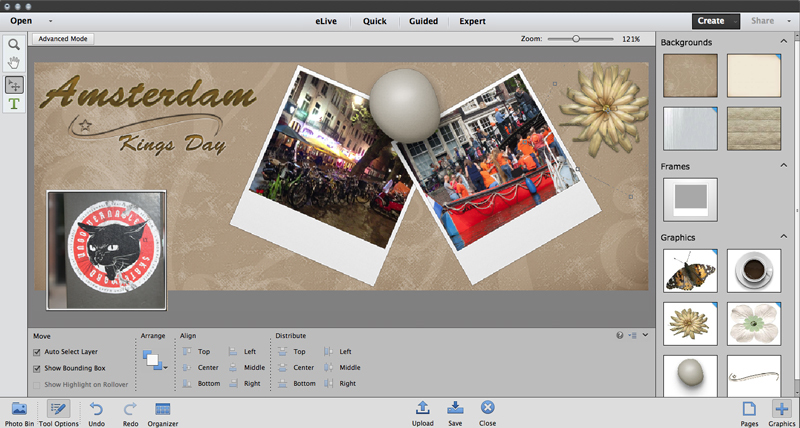 Within Elements’ Quick mode, Adobe has added four additional options to Effects, which offers many additional one-click photo enhancements. Tryouts are swift, easy and fun. Five effects variations for the pencil sketch. It seems like cropping images should be the least of anyone’s problems — all you need to do is decide on the most important element of the photo and crop so that it’s highlighted. Easier said than done for many novices (and even more experienced photographers). Composition is critical and cropping often is the deciding factor that makes or breaks a picture. The new intelligent Crop Suggestions feature gives you four choices for how best to crop your image according to the rules of composition. Of course, you don’t have to follow the app’s advice, and if you’re a veteran cropper with a good eye, you may not even need it. You get a choice of crop suggestions. For most newcomers, video timelines are no fun at all, and neither is plowing through miles of poorly lit, badly shot footage. 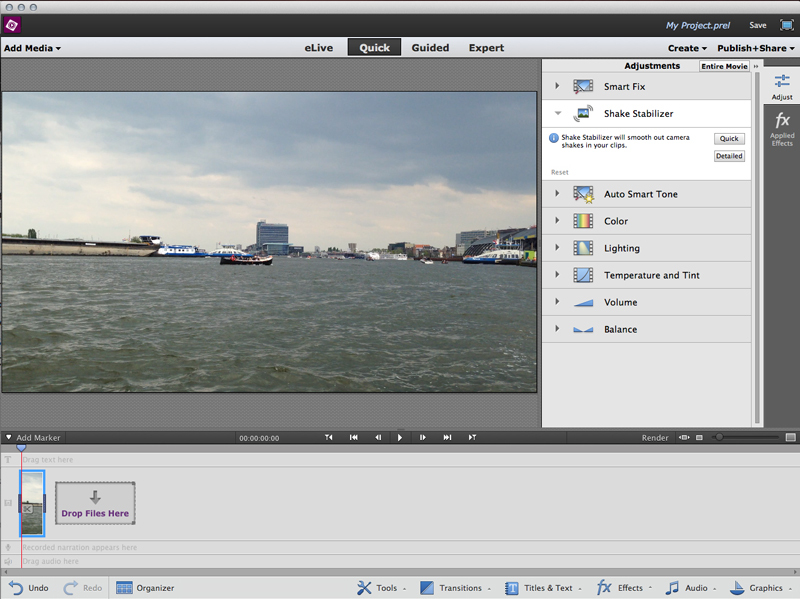 Premiere Elements seeks to lessen the pain with new features that hasten the process of choosing clips and offering creative new effects for footage and titles. 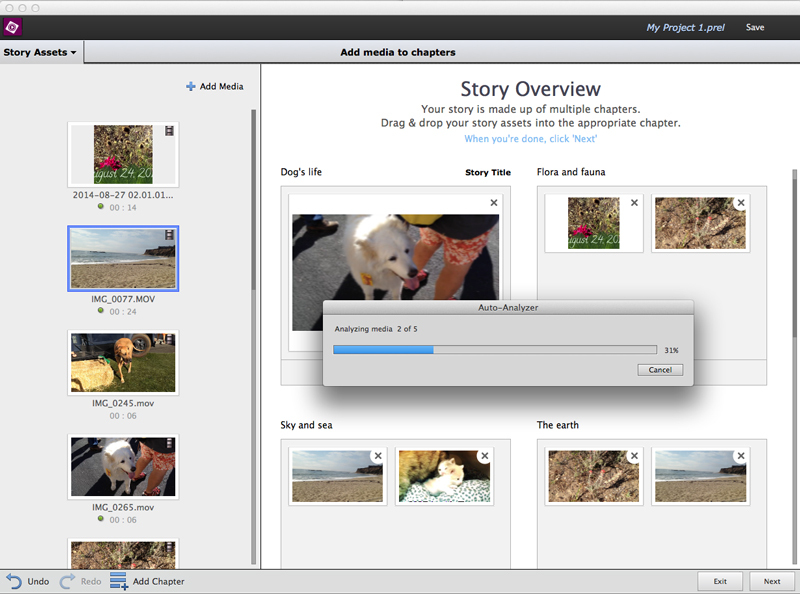 The new Video Story feature automatically assembles clips, transitions and music based on an overall theme for professional looking results. Video Stories lets you pick a story type from a set of built-in templates and grab clips for each chapter while the software does the rest—trimming, transitions and music based on the template you choose, for a full-on production. I found this feature fun and easy. Plus, you can choose your own music for the production instead of relying on the built-in scores. With the new Favorite Moments feature, you only have to view a clip once — or maybe twice — to decide which parts are worth keeping. Elements lets you mark your favorite parts dynamically as you view, and then preview the results. You can change your selections with a drag and drop on the timeline and click Done when you’re finished. Elements automatically inserts transitions between the cuts, resulting in a serviceable little movie. Favorite moments are marked in yellow. Guided Edits in Adobe Elements are a hoot. Even if you know nothing about what you’re doing, animated arrows and text directions pull you through each step. You can now use new guided edits to add motion inside your movie titles, and to enhance the narrative with effects or blurs. 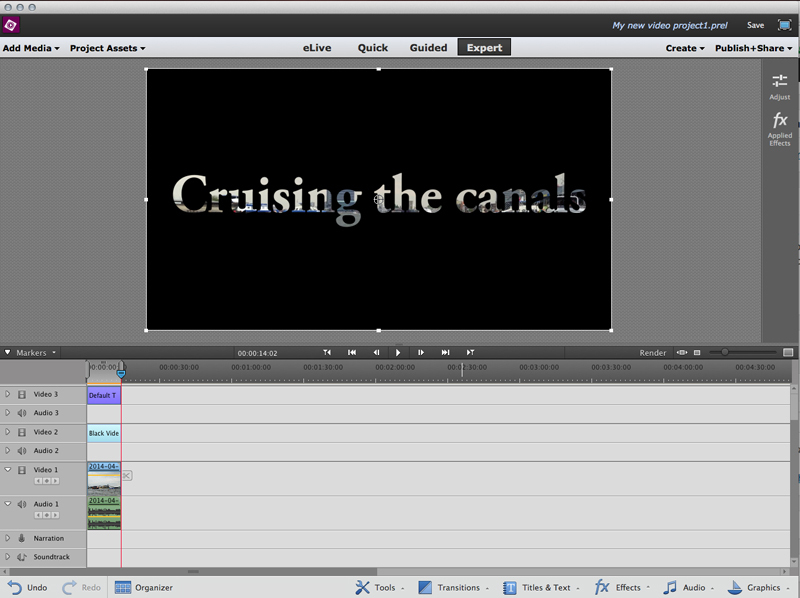 Guided edits help you create animated titles. 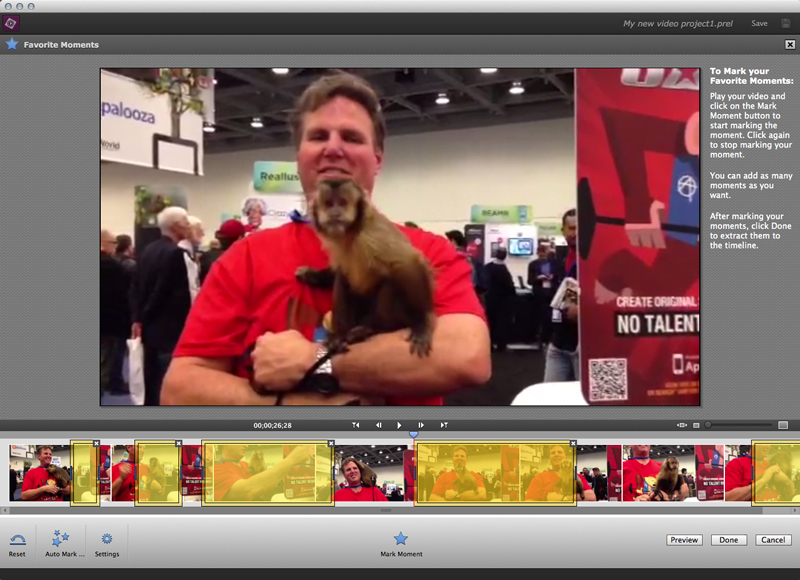 Adobe also has enhanced the video editor’s Shake Stabilizer feature to better calm shaky video. Image stabilization has been improved in version 13. 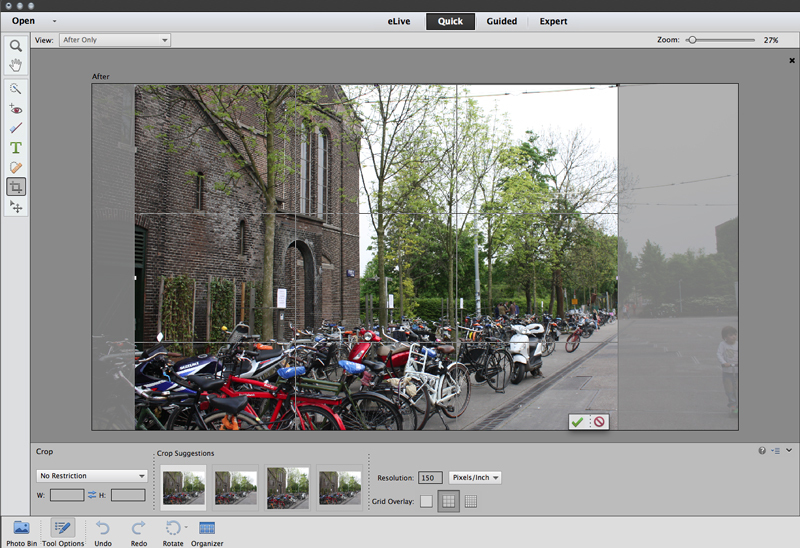 Adobe’s consumer photo editing and video apps are available for Macs running OS X 10.8 or higher and Windows 7 or higher. ￼￼￼￼￼￼￼￼￼￼￼￼￼￼￼￼￼￼￼￼￼￼￼￼Both Photoshop Elements and Premiere Elements are available now for $99.99, including the Organizer utility. If you buy both as a bundle, the cost is $149.99, including the shared Organizer app. Upgrades are $79.99 and $119.99 respectively. Academic pricing is also available.